My dear friend and former Drammy Committee colleague Jack Featheringill is famously quoted as saying that a good performance makes you cry, but a great performance leaves you with a lump in your throat. So I suppose that the painful feeling I’ve had in my chest since he died, on July 3, must be a tribute to the wonderful, exhilarating, astonishing performance that was Jack’s whole life…a life that we are celebrating tonight at Portland Centre Stage, where we hope you will join us. When I first started the Drammy Awards page on Facebook (which I hope you will both like and “like”), I thought that displaying some actual awards in situ might be fun (and thank you to those people who have already sent photographs…please, others among you, send more! ), and so it has been. Jack’s death of course subsumed all other intentions, and came to dominate all thoughts. 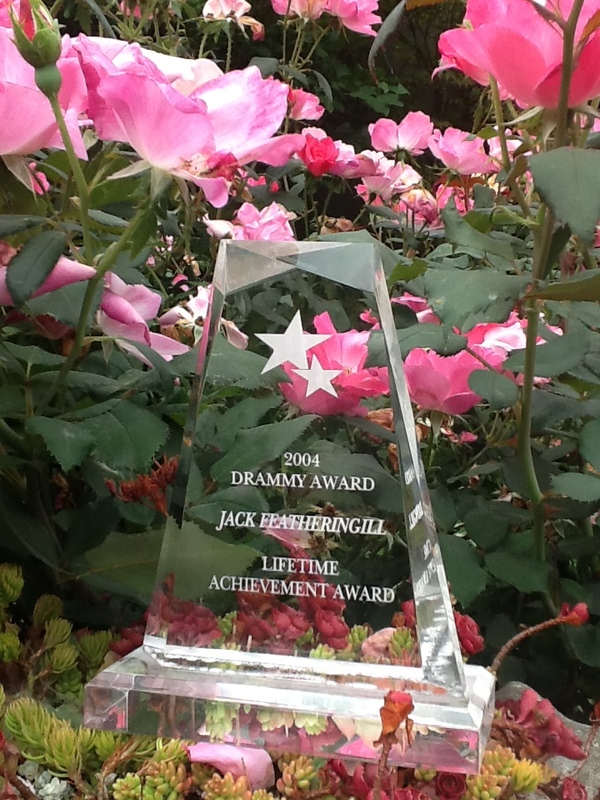 So today it seems fitting to show, on both that Facebook page, and on this website, Jack’s own Lifetime Award, from 2004. I am only the temporary custodian of this memento, but this morning I took it out into my garden, where I often sit and think of him. So this, selfishly, is in situ for me…but I hope it is an image you will be glad to share. I think of him, too, each time I go to the theatre (he was my frequent companion, and I never stopped learning from him, and loving him). And I will think of him in committee meetings, and at awards ceremonies, and everywhere. I carry him in my heart. And of course we will all think of him this evening. I know I will not be alone with that painful, painful lump in my throat, even as we smile and wonder at his great and remarkable achievements. Monday, August 26, 2013, Portland Centre Stage, Doors open around 6.30 P.M., Celebration begins at 7 P.M.